Backpack Journalism at Creighton University is a collaboration between the Theology Department and the Journalism, Media, & Computing Department. It came about because of a theologian interested in social justice and filmmaking and a journalist and an artist interested in filmmaking and social justice. Each summer, a small group of students travels to a community in search of a story. Led by professors Dr. John O’Keefe, Tim Guthrie, and Carol Zuegner, the students immerse themselves in the communities, interviewing, filming, recording, and writing. When they return to Creighton, they take the stories they have collected and develop them into a short documentary film. The Backpack Journalism documentaries have been accepted at several film festivals, including the Omaha Film Festival. The class has traveled to such far-flung places as the Dominican Republic and Uganda, Bethel Alaska and Nogales Arizona/Sonora. The next project is tentatively planned for Northern Uganda in 2018. For more information or to apply to participate in the Uganda 2018 project, contact Dr. John O’Keefe (jokeefe@creighton.edu) or Dr. Carol Zuegner (carolzuegner@creighton.edu). If Africa is hopeless, then God must be a comedian. If children are the future, then it is Africa that should have the most hope of all. If it is overcoming adversity that makes the man, then these children are more man than I. This is not a critique of western culture, or a monologue detailing the white savior industrial complex. This is a celebration of the children that I have seen in Africa: not of their suffering but their ability to overcome it. Yesterday I was at Ave Maria, a vocational boarding school of sorts in Lira. 1 in 3 of the over one hundred children are HIV positive. Most are orphans. Yet, this was not the topic of our visit. It was them who put on a performance for us, who greeted us, and who honored us with their warm welcome and passionate music. These children have experienced war, death, and poverty. Their boogie man at night was very real, and would abduct them while they slept if they were not careful. But it was them who invited us to dance. There are plenty of excuses for them to hide behind, to remain silent in self pity. But instead the children at Ave Maria sing and dance for us with memories of the past, love for the present, and investment in the future. The children who live in the village behind our living complex confidently lead us along a dirt trail network and proudly show us their homes (a small one room hut with no door) and their football pitch (an open field with rocks and wooden poles). They ask me my name and mimic my sounds and movements. I have noticed that every day I see them they are wearing the same ragged, ripped, poorly fitting clothes. Today we played with an empty plastic bottle but they did not seem to notice. So one may mourn for the sorrows that Africa has experienced, but I mourn for those who think Africa is hopeless. Given peace, these children can grow. Given education, these children can make a living. 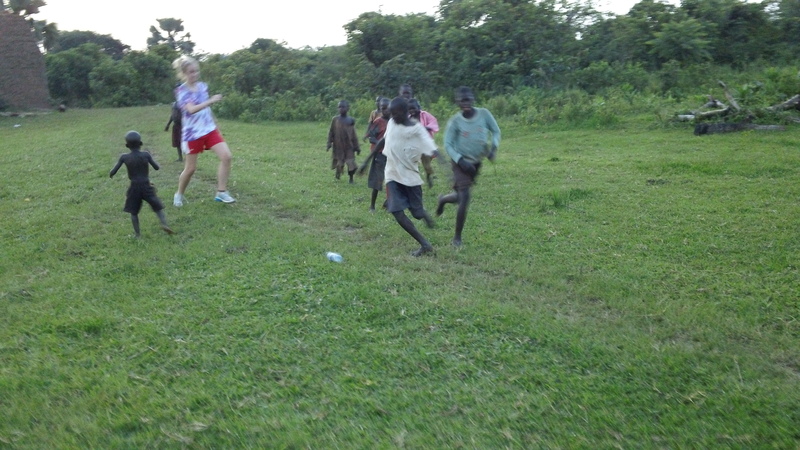 Given opportunity, these children can change Uganda. I spent some time in Africa myself a few years ago, and this reflection is THE best articulation of the overarching emotion of my time in Ethiopia as well. Thank you for your eloquence, for your open eyes, and for your willingness to be “childlike” with your awe. Keep going! Thanks Jason – Very good perspective and challenge to each of us. They can change Uganda as you are being changed and changing me and others. Thanks for that. Thank you Jason for sharing your observations and experiences so eloquently. Just one question, can you let us know through your blogs how everyone is doing healthwise. With all the stress and exposure to a different environment we just want to know everyone is adjusting well. I’m excited that you can be there to experience this at this place in your life. We have experienced this in Kenya in 2008. You are learning what we learned only much earlier in life. Don’t ever forget it. I doubt you will. Loren and your dad and I are having our Friday breakfast. God bless you and your team. Jason, I hope you realize how powerful and profound these words are. It’s uplifting to get the sense of hope despite the incredible conditions and challenges. These are life changing experiences that will be with you the rest of your life. Be safe. Jason, thanks for sharing this. Ave Maria sounds like a beautiful place and the children are an inspiration to us all.